TOKYO -- Japanese airbag maker Takata has filed for bankruptcy protection in Japan and the U.S., succumbing to the weight of the world's biggest automotive recall. Takata said it would sell key assets to U.S. supplier Key Safety Systems. Key Safety, based in based in Sterling Heights, Michigan, said separately it would buy “substantially all” of Takata’s global assets and operations for $1.59 billion. The sale will not include some operations related to Takata’s scandal-plagued business in ammonium nitrate airbag inflators subject to the global recall that torpedoed the company. The inflators were prone to exploding with too much force and spraying vehicle cabin’s with metal shards. At least 16 deaths and 180 injuries worldwide were linked to the airbags. In February, Takata pleaded guilty to wire fraud charges in the U.S. for systematically withholding information about the defects and manipulating inflator test data. In January, a federal grand jury indicted three former Takata executives for criminal wrongdoing in connection with the safety defect. A month later, Takata agreed to a $1 billion criminal penalty. Key Safety said the ammonium nitrate airbag inflator operations would be run by a reorganized Takata following the closing of the transaction -- and they would eventually wind down. 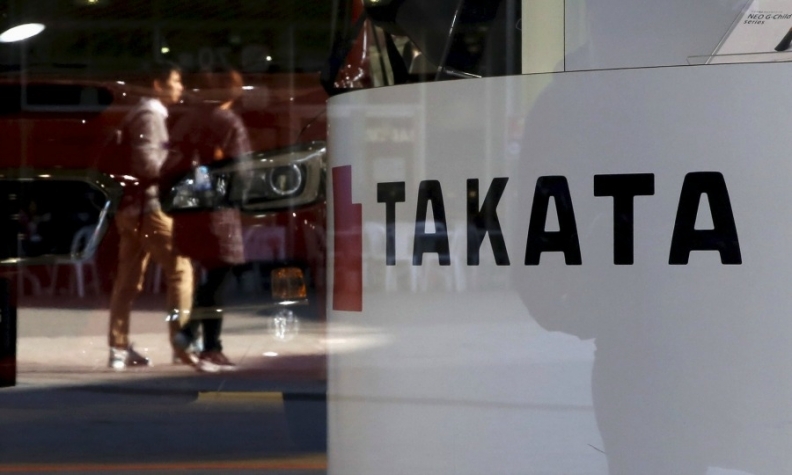 Takata said it would keep producing the components through March 2020 to ensure a steady supply of replacement inflators for the millions being recalled. Takata executives, led by founding family scion and CEO Shigehisa Takada, bowed in apology for the fall from grace during a Tokyo news conference to outline the bankruptcy. With liabilities mounting and finances collapsing, the supplier had no choice but to sell assets for cash, Takada said. Proceeds sale will be put toward paying down the liabilities, he said. "We spent much time on negotiations, it was extremely difficult to reach an agreement with more than 10 carmakers worldwide and a sponsor candidate company," Takada said. "If things are left as is, we are aware of risks that we may not able to raise fund and to continue stable supply of products," he said. "In light of the management environment we face, the state of negotiations with the sponsor candidate and carmakers, and the external expert committee's opinion, we have decided today to file for bankruptcy protection." Takata attorney Nobuaki Kobayashi said the total amount of liabilities was still unclear and that the supplier remained in talks with automakers to tally a worldwide cost. But some analysts put potential liabilities as high as $10 billion for ongoing recalls, penalties and settlements. The $1.59 billion from Key Safety would go only so far in covering that. As part of its U.S. settlement, Takata agreed to establish two independently administered restitution funds: one for $850 million to compensate automakers for recalls, and a $125 million fund for individuals physically injured by Takata’s airbags who have not already reached a settlement with the company. Meanwhile, 17 automakers -- including Honda, Toyota and BMW -- were listed as unsecured creditors with unknown claims related to recalls and indemnification, according to the filing. Additional litigation claims, which have not been estimated, included those from class-action plaintiffs in the U.S. and Canada and the attorney general of the U.S. Virgin Islands. The National Highway Traffic Safety Administration has an $180 million claim for fines and penalties. Recalls of Takata's airbag inflators began around 2008 and involve around 100 million inflators around the world used in vehicles made by 19 automakers, including the creditors listed in the case. Recalls are to continue through at least the end of 2019. Key Safety’s purchase aims to leverage other Takata assets, such as safety belts. "The underlying strength of its skilled employee base, geographic reach, and exceptional steering wheels, seat belts and other safety products have not diminished," Key Safety CEO Jason Luo said in a statement. "We look forward to finalizing definitive agreements with Takata in the coming weeks, completing the transaction and serving both our new and long-standing customers while investing in the next phase of growth for the new [Key Safety]." The deal is expected to close in the first quarter of 2018, Key Safety said. Key Safety, which makes active and passive safety systems, is an independently operated subsidiary of Chinese supplier Ningbo Joyson Electronic Corp. The Takata purchase is seen as giving Key Safety and its Chinese parent company a jump-start into new segments with a deep customer base. Takata's U.S. subsidiary, TK Holdings, late Sunday filed Chapter 11 bankruptcy in the U.S. and Takata filed bankruptcy in Japan (Monday morning Japan time). Bankruptcy will allow Key Safety to indemnify itself from legal liability related to Takata's airbags. The structure of the bankruptcy is designed to minimize supply chain disruptions, both Key Safety and Takata said. Key Safety also plans to retain all Takata employees and maintain operations in Japan, including the opening of a new regional headquarters in Tokyo. KSS said it will continue to support Takata’s customers, suppliers and employees and "embrace and honor Takata’s Japanese heritage." "KSS is the ideal sponsor as we address the costs related to airbag inflator recalls, and an optimal partner to the company’s customers, suppliers and employees," Shigehisa Takada said in a statement. "Throughout this process, our top priorities have been providing a steady supply of products to our valued customers, including replacement parts for recalls, and a stable home for our exceptional employees. This agreement would allow that to continue." At the news conference, Takada said he would step down after a new management takes over. The current management is expected to be reappointed at the company’s June 27 annual shareholders’ meeting to help smooth the transfer under Key Safety, he said. The family controls the supplier through TKJ Corp., a holding company of which Shigehisa has been listed as president and his younger brother Hirohisa has been listed as a director. But CEO Takada said that model was no longer viable. "Effectively, it is impossible for the founding family to remain as a big shareholder," he told reporters, declining to give specifics. Takata attorney Kobayashi said the old Takata entity may be liquidated when operations are handed to Key Safety and shares would be “processed” then. Takada maintained a low profile as the airbag scandal spiraled into a global crisis and the family-controlled company’s finances sank further into the red. Takata was founded in 1933 as a textile company and even manufactured parachutes for the Japanese military during World War II. It went public with a stock exchange listing in 2006. According to admissions made in Takata’s February guilty plea, Takata schemed to defraud customers and auto manufacturers by faking airbag inflator test data from 2000 to 2015. Even after inflators began to experience repeated problems in the field, the U.S. Department of Justice said, Takata executives continued to withhold the true test data. Automakers have already shifted business away from Takata and toward rivals for about 70 percent of the parts to repair defective airbag inflators. Only 38 percent of the 43 million airbag inflators under recall in the U.S. had been repaired as of May 26, according to data on the U.S. Department of Transportation's National Highway Traffic Safety Administration's website. Takata was negotiating with other potential buyers -- including market leader Autoliv of Sweden -- months before reaching a deal with Key Safety. Dustin Walsh of Crain's Detroit Business contributed to this report along with Bloomberg and Reuters.